I’m starting my first review this year with a hype product, which has gained much love from green beauty community: Kimberly Sayer Gentle Almond & Lavender Face Scrub*. 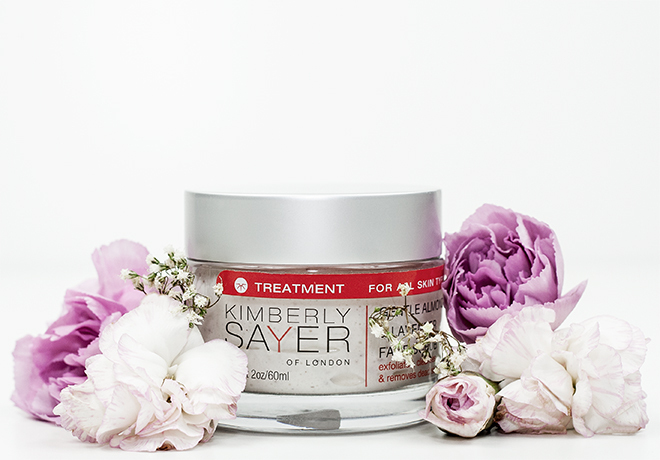 This is the second product of Kimberly Sayer, an award winning organic skincare line, that receives so much attention and love, with the first being Ultra Light SPF30 Facial Moisturizer. 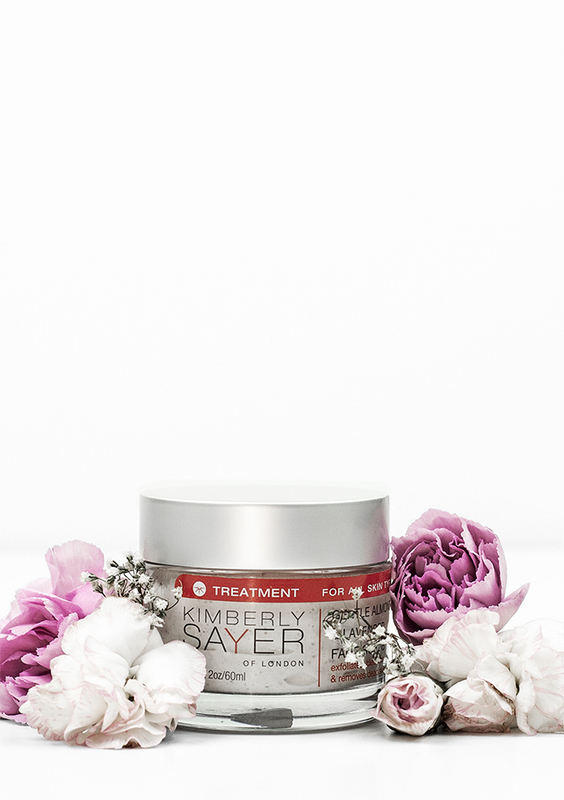 The Gentle Almond & Lavender Face Scrub comes in a beautiful 60 ml jar with a silver lid. If you like nutty scents, you’re in for a treat with this scrub, because it has almond-like scent with an intense sweetness to it. We all know that skin exfoliation is important during all seasons, but it’s often overlooked in winter because it tends to be more sensitive and lacks moisture during this time of the year. Many scrubs and exfoliating products, even made with natural ingredients, often are too harsh to use for delicate skin and can irritate or even dehydrate it. Well, with this face scrub this won’t happen. Because of its non-abrasive nature and creamy texture, Gentle Almond & Lavender Face Scrub is suitable for most skin types. Almond meal, jojoba beads and oat beta glucan are main exfoliating ingredients in this scrub. I can definitely feel the tiny beads when I’m using it, but they have gentle and non-irritating effect, at least for my skin. I try not to rub, but instead to pat it on my wet skin, that way I can assure it’s being used as gently as possible. The scrub also contains shea butter, almond oil and aloe vera gel, which leaves the skin nourished. However, I still use one of my night-time serums for additional nourishment. According to Kimberly Sayer, the scrub can be used daily, if required. I use it once a week in the evenings, before bed time. Ingredients: Deionized water, Almond oil & meal, Safflower seed oil, Shea butter, Jojoba beads, Glycerin (vegetable), Lavender water, Hydrolyzed sweet almond protein, Aloe vera gel, Arnica, Comfrey, Almond & Oat extracts, Milk amino acids, Ylang Ylang & Orange essential oils, Lecithin, Vitamins A.C.E, Xanthan (vegetable gum), Coconut Oil, Japanese honeysuckle extract (preservative). 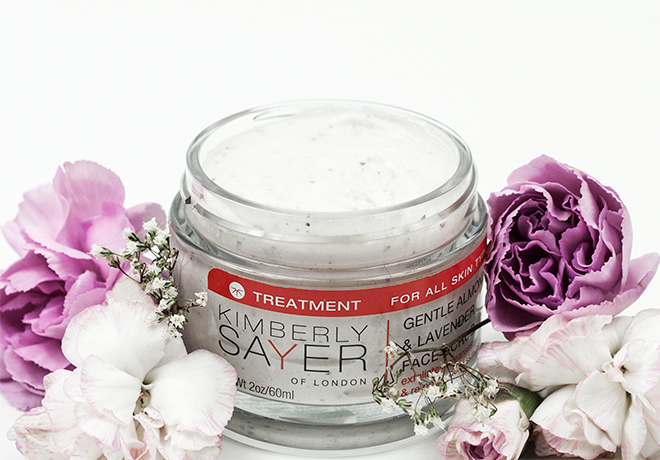 Kimberly Sayer Gentle Almond & Lavender Face Scrub is available online at Love Lula (worldwide delivery) and Kimberly Sayer official website (US only) in 60ml jar for $28 / £21.60. Have you tried this scrub or any other products from Kimberly Sayer line?